There are many innovations that have liberalized and changed the world for women over the years. Getting rid of the corset. The realization that women don’t have “week nerves” and that “hysteria” is actually nonsense. The C-section and the forceps just to name a few. 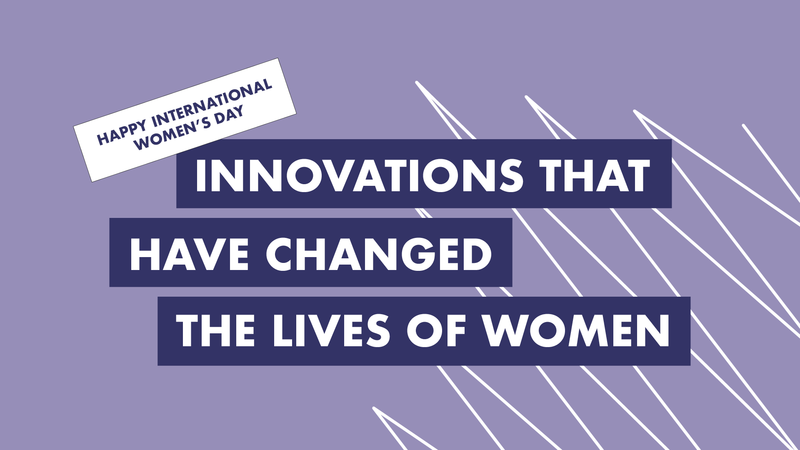 At Storm we are therefore acknowledging The International Women’s day by shedding some light on three innovations that have empowered women and transformed their lives over the last century. The Pill! One of the most major feminist inventions in human history. Approved in 1960, it was the first reliable, woman-centric contraceptive option which allowed women who didn’t want to become pregnant a greater control of their reproduction and with that, their lives. Before, women had little control over their reproductive body and had to fully trust and rely on men and male-centric methods such as condoms. When an unexpected pregnancy occurred the only option were, either childbirth or illegal and highly dangerous abortion. Therefore, to say that the Pill didn’t just improve women’s lives, but also saved countless of them is not an exaggeration. When talking about the Pill, it’s also important to acknowledge that no matter how great it is and has been, it came at a high cost. It emerged from a series of extremely unethical experiments performed on women of color and patients in asylums, who were not given any information about the tests being conducted on them. Something that shouldn’t be forgotten even though we today know that the result have been incredibly important. Not only for women’s control over their own reproduction, but also as an invention that set the groundwork for other revolutions. As things go once women were more able to control their childbearing, they were also able to enter the workforce and get educations with more impunity. More information about the history of the Pill here! One invention that was not at all intended for women but that have had a big impact on the emancipation of women is the bicycle. In the beginning of the 19th century women were even warned that riding bicycles was “immoral” and doctors even went so far as to say that it could lead to a terrifying medical condition called bicycle face — a special risk to women’s appearance and complexion. And that was not the only resistance against women riding bicycles. Heavy skirts and hard-wearing coresets made it hard for women to move and breath, and even harder to ride a bike. Even so, and maybe because of this antagonism between the society and the cycling women, the bicycle became a symbol of “free, untrammeled womanhood”, as American women’s rights activist Susan B. Anthony so eloquently put it. It gave women a newfound freedom of movement, challenged stereotypes about women’s physical strength and transformed dress codes. The later to the extent that the first women pants were designed and The Rational Dress Society was created – an association that took up the fight against unhealthy and unpractical clothes that made it hard for women to physically move. The women movements of the time, the Suffragettes, even used the bicycle when riding around, spreading the word about female voting rights. More information about the history of the bicycle here! The breakthrough invention that improved women and girls’ hygiene and health, school attendance, livelihoods and economic opportunities. Today many of us take them for granted, but the fact that sanitary pads and tampons still isn’t a matter of course in all parts of the world make you realize, just what a breakthrough invention in actually is. It was not more than a century ago that nurses in France created the first disposable sanitary pads, and at the end of the 19th Century, the first commercially available disposable pads came out . (Even though it took several decades before they evolved to become somewhat more practical for women to use and acquire). And, today, in spite of some efforts, sanitary pads still remain out of reach for millions of women and girls living in poverty and are taxed in several countries around the globe, including as a “luxury” item. One of the main things to consider about both of these inventions is convenience; the bother of having to cope with ineffective methods of period management, plus the stigma attached to the whole process, was a burden on women that created stress and through poorly assembled homemade methods the possibility for disease. And unfortunately, it’s not a burden purely of the past. Periods still remain a taboo topic. Stigma and discrimination surrounding menstruation prevents women and girls in some countries from entering physical spaces, such as their home, school, work or place of worship. Giving women access to easy, safe, disposable methods of managing their periods might not solve the whole problem of discrimination, but for a lot of girl’s and women it would mean that they could stay in school and the workforce, and protect their health. More information of sanitary pads history here! And here’s some more information about “menstrual huts”!